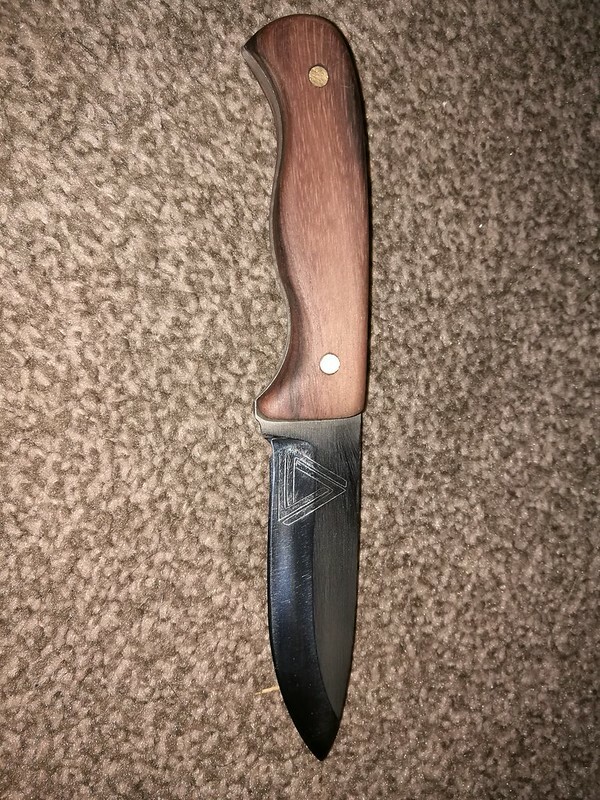 Thread: Handmade Bushcraft style knife. My son is an amateur knife maker with the emphasis on amateur. He has had no training but has studied the craft on-line. He has made himself a home forge from firebricks and a gas cylinder and I have financed his grinders, sanders, pillar drill, etc, etc, etc. He is making lots of different pattern knives but particularly loves the Japanese style stuff, though not exclusively. Anyway, he does bring out a "normal" style occasionally. This is his interpretation of a bushcraft knife. Blade is 01 carbon steel (the proper stuff). hardened to skate a file then tempered for 1 hour at 205 DegC. Blade length is 4". Blade thickness is 4mm. Anyone wanting a particular style of knife just has to PM me and I'll see what Dan says. This bushcraft knife is a steal at £45 plus P&P. PM me if interested. Last edited by meirion; 21st-August-2017 at 04:38 PM. Looks okay but you really need info on thickness of blade, tempering etc too? Thanks Steve, will update the original post. Sorry, I'm not in the market for such a knife. But I think your son deserves all credit for teaching himself the skills to keep alive the art of knife making. Good luck to him. Dan doesn't do leatherwork but will do kydex if required. Give me a shout if it's of any interest. Also let me know if you are interested in any other pattern blades. I can easily post pics of the other stuff that we have, tantos and allsorts! Looks a treat. He's done well. This one is not for sale because I've already bought it as a wedding present for a friend who is a chef. 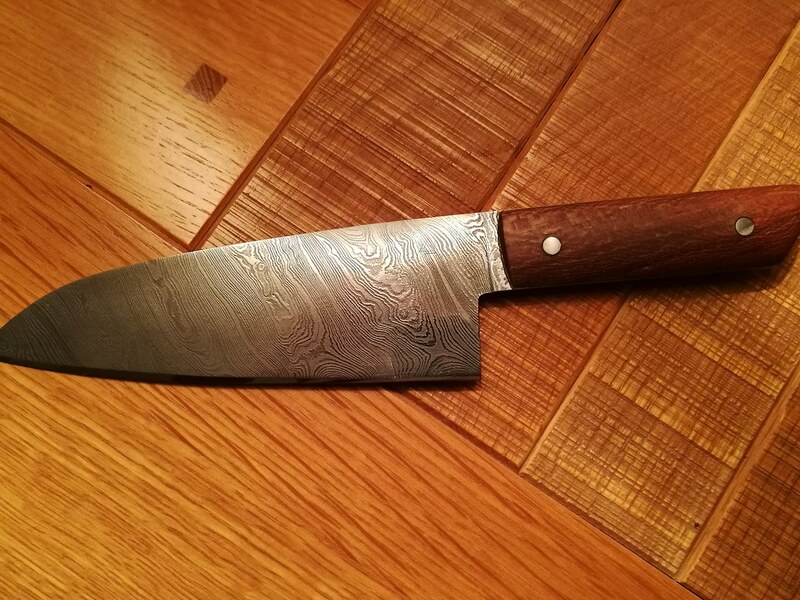 It's a chef's knife made in Damascus steel. Lovely. PM me if you have a knife pattern you want and I'll ask Dan if he'll do one. It’s been a while, how’s your son getting on with this craft? He's improving fast. Some of the stuff he's making is gorgeous. I'm no expert (by a long way) but I'm impressed. He's currently building a new, larger forge. He's getting commissions for all sorts of stuff. He's just delivered a "non-sharp" Viking seax for a re-enactment fella and is currently doing a "skinning" knife for a friend. Does he still make those bushcraft style knife you started the thread with? Hi French Erick, yes he's still doing any pattern knife that is asked for to be honest. The more variety the better for him. PM me if you are interested in anything. Meirion's son has made me a beautiful knife at a very competitive price. As soon as I get myself some online account to store photos, I'll be able to post what I now own. Despite claiming to still be a learner (aren't we all still learning to reach perfection?) I received a beautifully crafted object taking into account everything I asked. Granted, it was my first time purchasing such a knife and didn't know that much about what I would want. Though, I knew what I wanted to do with it, the general shape and how I wanted to carry it. All of which have been taken into account. The knife is beautiful, very well balanced with a comfortable handle (not carved with it but that's what it is for) and incredibly sharp (I asked for a scandi grind and I got one). I don't know my steels but he used 1095 steel and I will have to see if the edge retention is good. The sheath is skydex (skidex?) and as pretty as that kind of things can be. It is very practical and the position is changeable if I come to dislike the set-up I asked for. I doubt I will as it feels it belongs where I carry it. I am delighted with it. There are some aspects which could be improved on but not at the price I got it for. If you want to treat yourself or a love one, you probably wouldn't go too far wrong with the option. I will try to review this again after a more prolonged use and hopefully there'll be photos to accompany it. Thanks for the review Erick, Dan is pleased that you are happy with your purchase.